2009 saw a long-awaited stabilization in orphanage submissions for international adoption (IA). 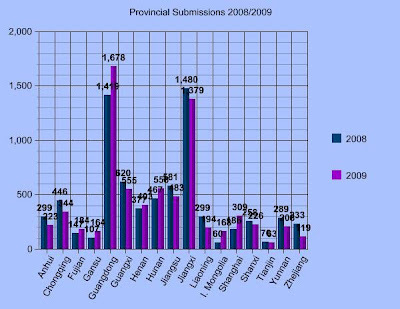 Having fallen substantially since the Hunan scandal of late 2005, last year saw overall submissions manage a small increase over 2008 in the seventeen primary Provinces involved in IA. These seventeen Provinces, which include Anhui, Chongqing, Fujian, Gansu, Guangdong, Guangxi, Henan, Hunan, Jiangsu, Jiangxi, Liaoning, Inner Mongolia, Shanghai, Shanxi, Tianjin, Yunnan and Zhejiang, increased their collective submissions half of one percent, submitting thirty-four additional files in 2009 than in 2008 (7,139 vs. 7,105). As is always the case, there is a wide disparity between Provinces. Provinces that saw increases from 2008 to 2009 include Inner Mongolia, which increased 180%. Shanghai and Gansu also saw significant increases (66% and 53% respectively). Hunan's nearly 20% increase allowed it to regain its position as the third largest adopting Province, while Guangdong's 18% increase caused to to surpass Jiangxi as the largest internationally adopting Province. Provinces that saw significant declines include Chongqing (-23%), Jiangsu (-17%), Yunnan (-28%), Liaoning (-35%) and Zhejiang (-49%). Overall, ten Provinces saw adoption submissions decline, and seven saw increases. The gender balance continues to move toward parity. Overall in 2009, 2,246 boys were submitted, or 31% of the total. This was an increase of 11.6% over 2008. Again Inner Mongolia was the fastest growing, almost tripling the number of boys submitted (272%). The Provinces with the highest percentage of boy submissions include Inner Mongolia, with 64% of 2009's submissions being for male children; Tianjin (59%), Shanxi (57%), Henan (54%), and Yunnan (53%). This shift towards boys began in earnest in 2006. Chongqing, for example, saw male submissions increase from 9% in 2006 to 30% in 2009. Guangdong saw its gender ratio increase from 8% boys in 2006 to 28% in 2009. Hunan saw similar increases. The only Province that saw its percentage of boys fall was Shanxi Province. In 2006, almost seventeen hundred boys were submitted, representing a little over 15% of the nearly 11,000 children submitted for adoption that year. Overall, seven Provinces submitted more boys than girls for adoption in 2009, up from five in 2008. The Province with the lowest gender ratio continues to be Jiangxi, which had 4% of its 2006 submissions as male, a ratio that doubled to 8% boys in 2009. Within each Province, however, adoption submissions vary greatly. We are considering each Province's specific patterns on our subscription blog, but a few examples will illustrate the point. Although the average orphanage in Guangdong Province saw adoptions increase 18% between 2008 and 2009, the bulk of the Province's increase can be traced to only four of the sixty-five orphanages: the Guangzhou orphanage, which saw submissions increase 65% to 202 submissions; the Longgang orphanage in Shenzhen, whose submissions increased 395% to 119 in 2009; and the Lianjiang orphanage, whose submissions increased 285% to 81; and the Zhongshan orphanage, whose submissions rose 127% to 100. Collectively, these four orphanages submitted 300 more children for adoption in 2009 than in the previous year, more than the 260 increase in submissions seen in the province overall between 2008 and 2009. A similar pattern can be seen in Jiangxi Province, where the Yiyang orphanage saw a 314% increase in adoptions, while the Poyang orphanage saw a 24% increase, even while the average orphanage experienced a 7% decline in submissions. Taken globally, the supply-side of the wait-time equation for China adoption appears stable, with a slight upward bias. On the demand side, the number of waiting families appears to be declining going forward, with the recently completed March DTC group being the largest for 2006. The second largest DTC group is April, which is currently being referred children. DTC group size falls significantly after April, so on the demand side there is a bias downward. Taken in connection (rising supply, falling demand) and families can expect referral batches to increase in the number of DTC days referred as we move forward. Although wait times will continue to increase, the rate of increase is tempering. Do your numbers include special needs kids who've been referred for adoption? The ads include that information, but as you can imagine it takes a lot more time to catalog SNs than gender. I will be working on that for a later posting. for those of us waiting, this is wonderful news! we are LID 9/19/06, and I'm wagering that we'll have our referral in about one year's time.... which would mean an average of 13.3 days referred per month from here on. if we can get through eight days of heavy april in one month, i'm hoping that the 13.3 won't be an outrageous assumption for the remaining, lighter months. hope springs eternal! The wait times boggle my mind. We were DTC in April of 2006. If we hadn't gone special needs, we would still be waiting. As it is, our daughter has been home for almost 4 years (travel in August 2006). Furthermore, her SN turned out not to be anything at all. She was perfectly healthy and she is the smartest child in her 1st grade class. I apologize for boasting, but if you do have readers who have a long wait ahead, they might want to consider the SN program. I'm curious what effect the potential Hukou reform will have on abandonment and adoption figures. If Migrants get social services and medical care with the abolishment of this, won't there be less abandonments because they will have more money to pay over quota fines and also be able to help their SN kids more through medical care? What do you think? Isn't this going on already in some areas like Shanghai and effecting numbers? Just curious. It will be interesting to see if it has any impact, but much of these "reforms" are simply bureaucratic talk, with little action. The DNA databases are a good example. After much fan-fare last year, they are still not operational. But I don't believe a significant percentage of children are actually abandoned due to registration or medical barriers. So, intuitively I don't expect much impact. When a province is not listed on the chart - such as Shaanxi, does that mean there were no adoptions or so low that it's not included in the chart?